My Best Chocolate Chip Cookies have finally made an appearance on The Hungry Wife! There are many recipes for Chocolate Chip Cookies out there, and most are pretty similar with slight changes in ingredients that make them special. Best Chocolate Chip Cookies are rich and hearty thanks to the dark brown sugar, whole wheat pastry flour, sweet butter, and extra vanilla. With temperatures dropping, there is nothing better than heading indoors and warming up with a mug of Triple Delicious Hot Chocolate. Seriously, this is without a doubt the most amazing hot chocolate my husband and I have ever had. 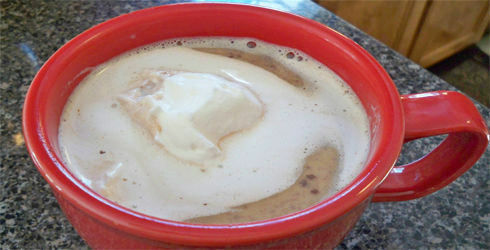 It is everything a delicious hot chocolate should be, creamy, sweet, and of course, chocolaty. 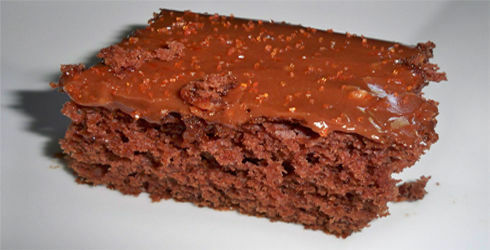 Initially my husband wanted me to add in a little extra chocolate, but after some taste testing we decided against it. Triple Delicious Hot chocolate, has more than enough chocolate just the way it is. 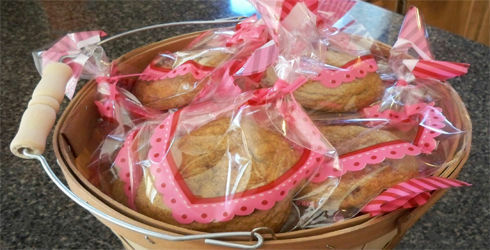 Recently I got the opportunity to review some baking products from Naturally Nora. I asked them to send me the cake and frosting mixes necessary to make their recipe, Peanut Butter Chocolate Layer Cake. My husband chose this one to fill his sweet tooth craving, and I must admit, chocolate and peanut butter is one of the best dessert flavor combinations. 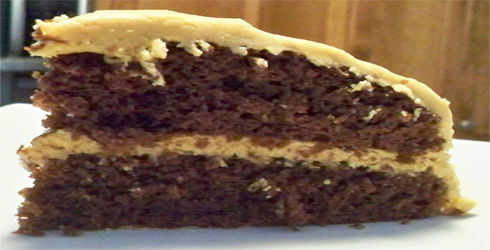 This Chocolate Espresso Cheesecake is super delicious, and I was thrilled that it turned out so well. If your a cheesecake lover, make sure to give this one a try. I was a little nervous because I made a couple mistakes during the cooking process. First of all, I forgot to melt the chocolate chips until I had poured half of them into the mixing bowl with the eggs and sugar. I proceeded to melt the remaining chocolate and added it to the rest of ingredients. Then, the cream cheese probably could have been softened a little more than it was. I have only made a couple cheesecakes before in my life, so when the filling came out a bit soupy I was really nervous, because I thought the last time I made a cheesecake it was thicker. I almost scrapped the entire project, but luckily I pushed through. It is really yummy, and I suggest using espresso to really give it a nice coffee flavor. 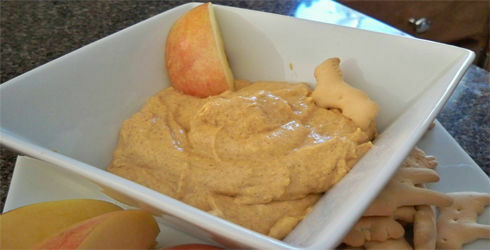 Pumpkin Pie Dip is the perfect treat for all those up-coming holiday parties, a perfect way to celebrate the season. I am so excited to post this amazing and easy appetizer recipe. If you are a fan of pumpkin pie, you will be in love with this dip. 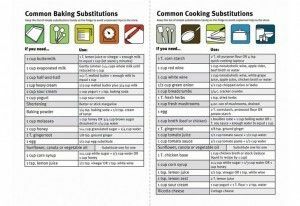 Plus, it is so easy to make anyone can whip it up fast. I was given the task of supplying a dessert for my husbands company picnic this year. Last year I brought a strawberry pie, which was excellent and went over really well, but the picnic also took place in June during strawberry season. Since they moved the picnic to September this year, I decided to come up with something a little different. Root Beer Float Cake was just what I was looking for. 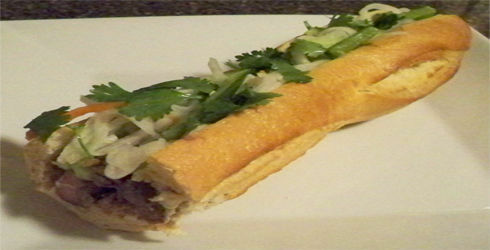 Banh mi is a Vietnamese sandwich made with a baguette. There are several things that make this sandwich extra special: the meat has a super flavorful lemongrass marinade, which is excellent with pork, steak, or chicken; the pickled radish and carrots along with cucumber add a tart and cooling flavor that helps to counteract the spicy jalapenos. I promise you, you will fall in love with the Banh mi sandwich and will be craving one all the time. Wander through the city of Paris, and you’ll find shop windows piled high with brightly colored Almond Macarons. Unlike the big, brash coconut version most of us are familiar with, these little jewels are all about finely crafted restraint. In France, however, most macarons are filled with buttercream, so preparing them is a fairly labor-intensive process. To make these Parisian Almond Macarons, The Hungry Wife simplified the fillings by using marmalade, jam, ganache, and curd. 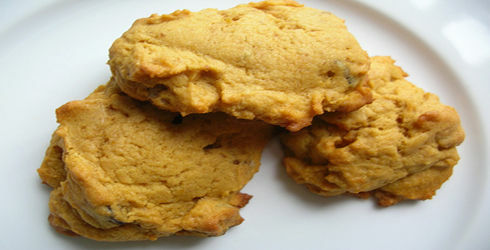 There is a single batter that could be used to prepare five different cookies. 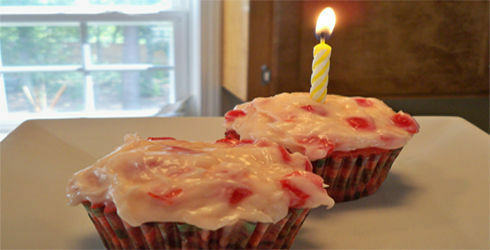 These Red Velvet Cupcakes were the first thing that came to mind when I was planning my birthday dessert. Cupcakes are growing in popularity with speciality shops popping up everywhere. To me, cupcakes have always been one of my favorite treats. They are little personal-sized cakes from heaven, that will travel with you and not make a mess. Has this ever happened to you? 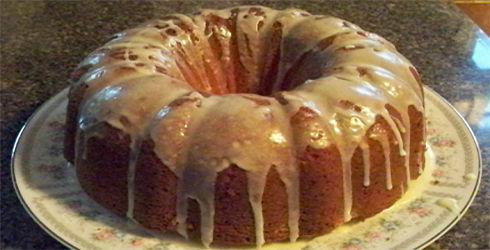 You just found a delicious sounding recipe that you really want to make, but you are missing a key ingredient. Now what? 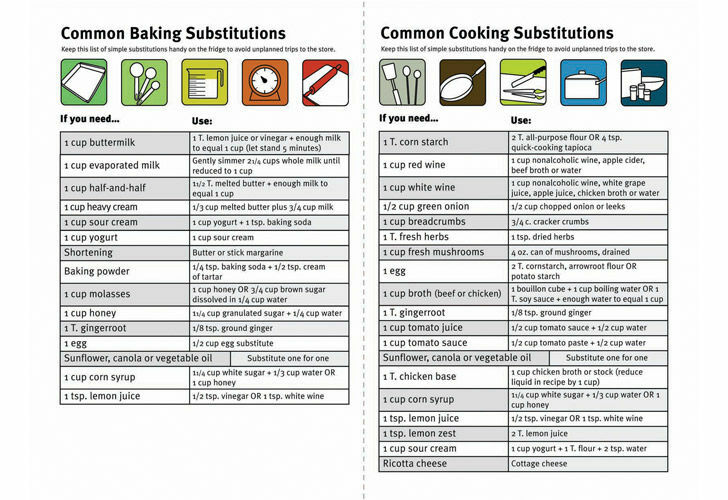 Well, here is a list of cooking substitutions for when this situation arises. Bourbon or Sherry, 2 tablespoons: 1 to 2 teaspoons vanilla extract. Add water, white grape juice, or apple juice to get the specified amount of liquid (when the liquid amount is crucial). Buttermilk, 1 cup: 1 tablespoon lemon juice or vinegar plus enough milk to make 1 cup (let stand 5 minutes before using) or 1 cup plain yogurt. Chocolate, semisweet, 1 ounce: 3 tablespoons semisweet chocolate pieces, or 1 ounce unsweetened chocolate plus 1 tablespoon granulated sugar, or 1 tablespoon unsweetened cocoa powder plus 2 teaspoons sugar and 2 teaspoons shortening. 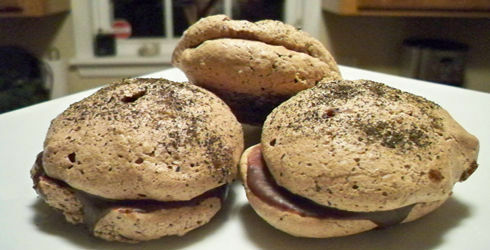 Chocolate, unsweetened, 1 ounce: 3 tablespoons unsweetened cocoa powder plus 1 tablespoon cooking oil or shortening, melted. Flour, self-rising, 1 cup: 1 cup all-purpose flour plus 1 teaspoon baking powder, 1/2 teaspoon salt, and 1/4 teaspoon baking soda. Foods that provide health benefits beyond basic nutrition are called “functional foods.” Functional foods do more than meet your minimum daily requirements of nutrients. They can also play roles in reducing the risk of disease and promoting good health.